Granville Middle School students may find more motivation to check out books at their school thanks to a donation from the Rotary Club of Granville. The club recently presented a check for $1,000 to eighth-grade teacher Pam Bice for use to assist seventh- and eighth-grade teachers in expanding their classroom libraries, giving students easier access to books with the aim of stimulating their interest in reading. 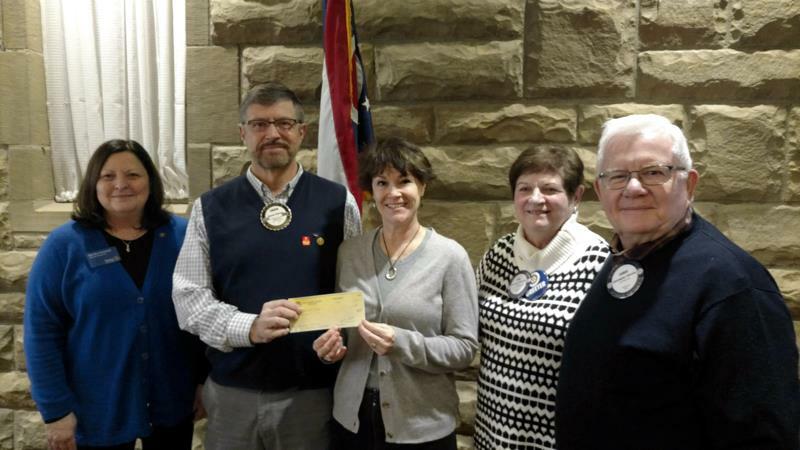 The donation, one part of Rotary’s Literacy Initiative, comes in the wake of the elimination of the GMS librarian position as a cost-cutting measure after which it was noticed that students were checking out fewer number of books. Bice is coordinating the effort. Another major aspect of Rotary’s Literacy Initiative is donation of books to the Granville Public Library with nameplates signed by speakers at Rotary’s weekly meetings. In a key annual event that is part of Rotary’s Youth Emphasis, the Leadership and Ethics Conference took place in November for 105 local 10th- and 11th-grade students from ten local schools. Held at the Newark Doubletree hotel, the conference emphasized understanding ethics and the importance of being fair to all concerned when making decisions is a message important to Rotarians, which is why the club facilitates the conference each year, said Amy Huddleston, who organizes the event. A variety of speakers present a multitude of ethical dilemmas the students may face in the future, Huddleston said, and the students were referred to the Rotary Four-Way Test to make decisions on how they’d handle a dilemma. “The purpose of the conference is to provide helpful tools to the students when they're faced with challenging situations in the future,” Huddleston said. • Rotarians, led by Steve Schneider, assisted with put-up and takedown of holiday decorations along the fence surrounding the Great Lawn of the Bryn Du Mansion. • Served a one-hour shift on Martin Luther King, Jr. Day for Granville’s Feed the Dream food collection for the Licking County Food Pantry, led by Service Director Bob Hays. Students of Granville High School’s Rotary-backed club, Interact, also assisted. • Filled one-hour shifts on a December Saturday ringing the bell for the Salvation Army’s holiday donations collection, coordinated by Brady Burt. • Conducted its twice-a-year litter pick-up on the T.J. Evans Bike Path between South Main Street and Moots Run Road, led by coordinator Tom Gallant. Granville Rotary holds its weekly luncheon meeting each Monday at noon at the Granville Inn, where new members are always welcome. For more information, log on to the club’s website at granvillerotary.org.